Basic Screens: There are three basic screens used, based on where one is within a given play. Figure 1, shows the screen when “We” serve. Figure 2, shows the screen when “They” serve, and figure 3, shows the screen layout after a serve has been made. The central portion of these screen consists of the 6 players in their respective positions (1 to 6). 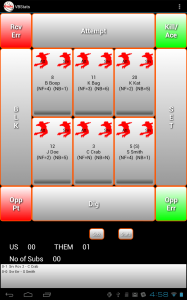 Within each players box are indicator as to whom the player is (name and jersey number), the player’s natural position for front and back court, indicators indicating whether the player is a Libero or Setter, The Service and Attempt percentages (historical and current) and their effectiveness measured in successful touches over total touches. Surrounding the players area are buttons which describe actions performed by the players. 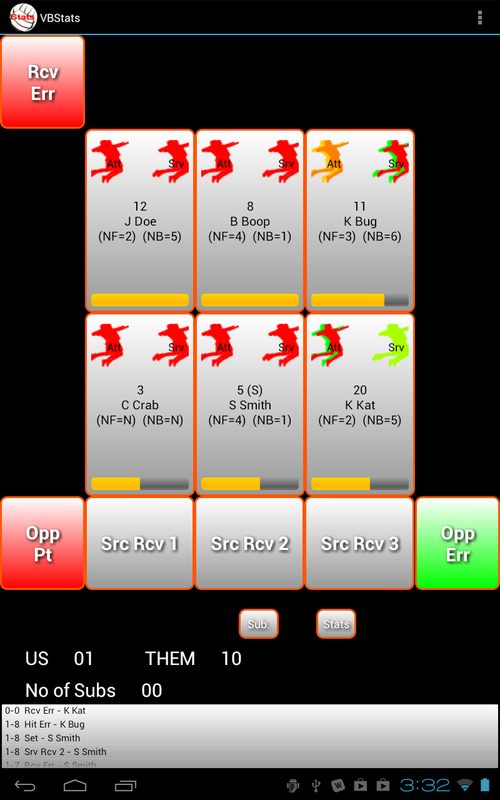 Green buttons indicate actions that generate points for the “We/Us” team, where as, the red buttons generate points for the opposing team. Below the main court and action buttons, are two buttons used to perform substitutions or to view the current match statistics for the players whom have played so far in the match. On the bottom of each screen contains the the current game score and the number of official substitutions that have taken place (libero substitution are not counted). Below this is a list of actions that were recorded. Stat Input: All statistic input is performed by first selecting the player performing the action by touching the appropriate player on the screen ( If “we” are serving, the player in position 1 should be already selected) and then touching the appropriate action. If in a service screen (figure 1), the action available are displayed (“Srv Err”, Service 1, Service 2, and Ace). Touching any of these buttons will apply that statistic to the selected player. Based on the action registered, the screen will automatically advance to next screen of possible actions. If a Service 1 or 2 was initially registered, but later turned out to be an Ace, pressing the Ace/Kill button in figure 3 will register an Ace for the player. If in serve receive screen (figure 2), the actions available are displayed(“Opp Pt”, Srv Rcv 1, Srv Rcv 2, Srv Rcv 3, Opp Err, and Rcv Err). Unlike the service screen, the player involved with the action being inputted, needs to be selected first, followed by the action performed. 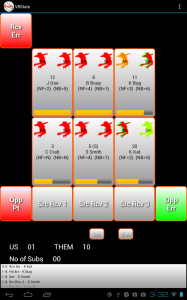 The screen will automatically advance to the next screen of possible actions based on the action performed. 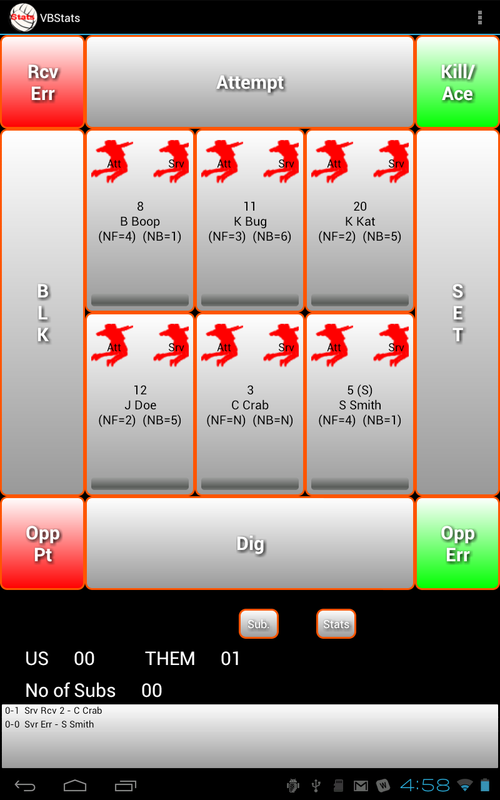 If inwith play screen (figure 3), the actions available are all the action needed once play has started (Attempts, Kills, Sets, Blocks, and Digs). As in the service receive screen, the player is selected first followed by the action attempted. If that action was in error, the upper left red button is touched. It’s content will change based on the last action registered. If a ‘Set’ was performed, the text within the button indicates a ball handling error if a n ‘Attempt’ was performed, the text will indicate a hitting error. Similarly, if the last action resulted in a kill, the upper right green button is touched. If a setter has been specified, just touching the setter button, will award the assigned setter with a ‘Set’. If a setter is not assigned or a different player is to be awarded with a set, the player’s button needs to be pressed first before the ‘Set’ button. Block Button:The ‘BLK’ (Block) button is a play ending button. As before, the player is selected first followed by the pressing of the block button. 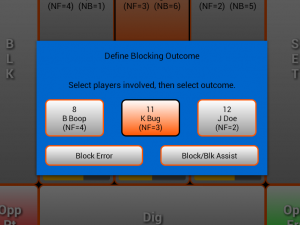 This button opens up a blocking dialog (figure 4) which is used to determine whether there was a solo block or a block assists or blocking error(s) occurred and which player(s) are involved. Select which player(s) involved with the block and the resulting action (Block or Error). 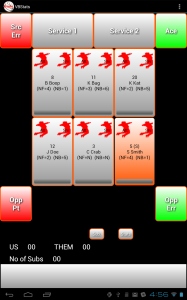 Stat Swiping: To facilitate the entering of player’s actions, a swipe feature is provided. By selecting a player and swiping in a given direction will replace selecting of the player and the separate selecting of the action. As a training guide, a menu option is provided that will show what direction provide what actions (See figure 5). 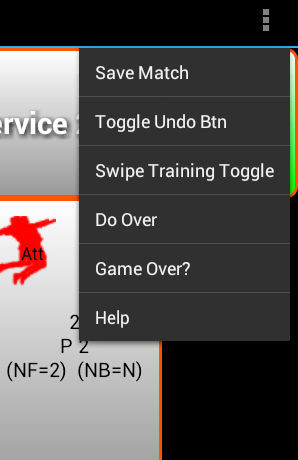 Pressing the Swipe Training toggle entry will turn on and off the training visual. 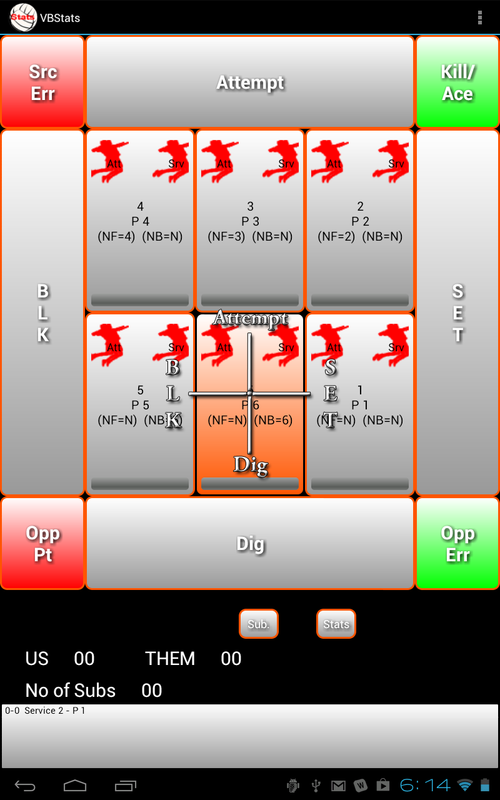 In figure 6. touching the player in position 6 generated an visual that shows a swipe to the right is a set, to the left a block, a downward swipe is a dig, and a swipe upward is an Attempt. The visual will change based on mode of play. Once the user is familiar with the swipe function, it can be turned off by again selection the menu option “Swipe Training Toggle”.